How do I see jobs in different countries? 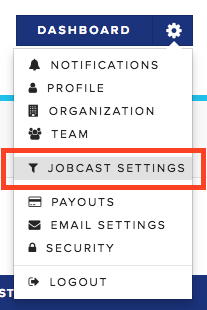 Update your region preferences in your JobCast settings. Do you work in another country or countries? It's easy to update your preferences to receive international JobCasts. Click the gear in the top right corner of your dashboard (shown below). 3. Click the network tab at the top of the screen (shown below). 4. Select individual nations where you're capable of recruiting. As new roles are released in these countries, you will be invited to work on them. You can also click on the "X" next to any country to remove that country from your preferences. If you remove a country, you will not receive future JobCasts from that location, but the existing JobCasts will not be removed from your dashboard. You'll have to reject those JobCasts to remove them.